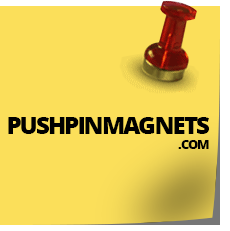 Review: List Pushpin Magnets - Incredibly Strong Pushpin Office and Refrigerator Magnets in Thirteen Styles. This picture shows a Pushpin Magnet holding up an all steel hammer. Can your refrigerator magnet do that? To put it simply - These Magnets Are Awesome! Every time our fridge was bumped or the door was shut too hard, every note, reminder, child's paper and everything else would fall to the floor. I was so tired and frustrated with trying to find strong magnets in different stores locally, I finally turned to the internet and found these. These magnets hold everything to the fridge, from calendars to bundles of coupons to kid's school projects - without any problems at all. My only regret was not buying enough the first time. As soon as I saw these magnets at work, I immediately ordered more. Try them out - you won't regret it. I use old metal signs as bulletin boards and these magnets are perfect. I made the mistake of only ordering a set of 12 and have so many uses for them I'm ordering more. They're attractive, strong, and reasonably priced. Took advantage of their offer of one free magnet and after receiving it was amazed at the strength considering how small they are. They can hold up to 20 sheets of paper on a fridge where others will only hold up six. I ordered a set of 24 and am happy. I've used these for two years now on my kitchen wall. These are the best fridge magnets ever. Whoever wrote that bad review must be talking about a different product. Our friends came over and were so impressed with them that Im just buying them a set now as a present (..and one more for us of course). I ordered these, received them in a timely manner, but was EXTREMELY disappointed. In my opinion, these aren't any stronger than a typical magnet. I now laugh at the advertisement picture of a pushpin magnet holding a hammer. To make matters worse, I've left 4 messages with no return call. RESPONSE - Because we were in fact very unresponsive by phone for about five days, we have refunded this customer's money and also let her keep the magnets. The particular Stanley hammer in our photo is available in most hardware stores if anyone is curious after you receive our PushpinMagnets. EVERY magnet we sell will in fact hold up this hammer just as pictured. We are choosing not to remove this post because this is only our third truly dissatisfied customer in seven years. We also believe removing it would make all the positive emails and the other unsolicited comments made here less valid. For their size, convenience, quality, holding power and value-- we truly believe we sell the the best magnets available! I love these magnets. So strong and colorful. I could not find any in the stores. So I went on line. Found these and bought them just to try them. They are great. Bought some for my family too. These are the best refrigerator magnets I have ever used. I ordered more to use as gifts. Copyright © 2016 PushpinMagnets.com All rights reserved.